How obvious is my love for everything to do with chocolate and nuts? My sweetest weakness. I believe that I was born with this preference… I don’t care which nuts they are and whether they are whole, ground or creamy. I like them all. 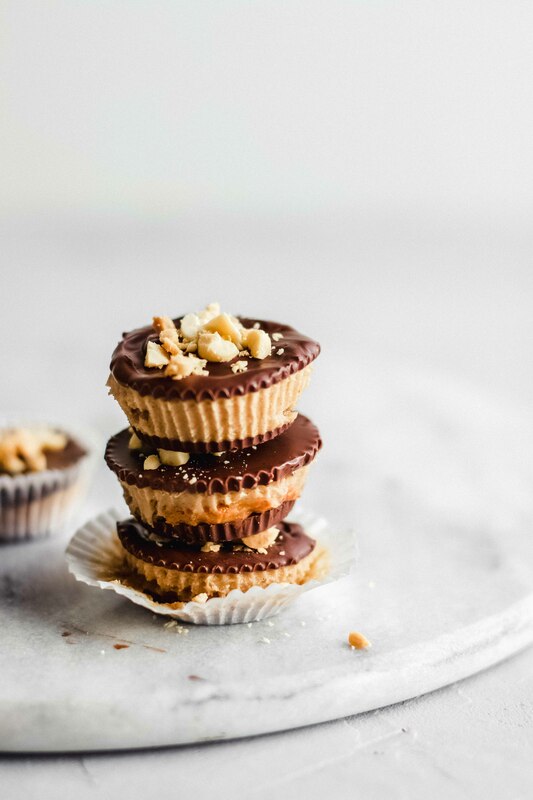 Since John comes from Canada, peanut butter flows more or less in his blood 😉 At his home there are meter-long shelves filled with peanut butter sweets in the supermarkets. One of the most delicious are the Reese’s Pieces. 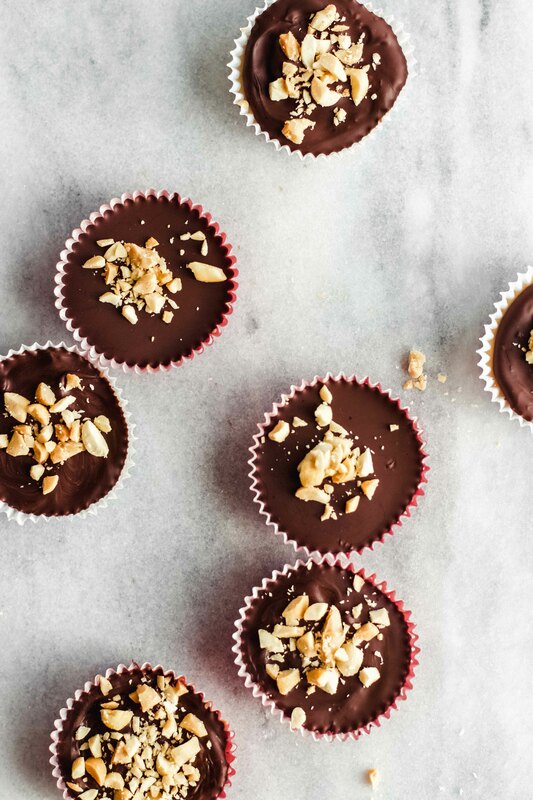 A soft, slightly salty peanut butter cream coated in chocolate. Heaven. It is logical that each time I visit Canada, a kilo of my luggage is reserved for such ridiculously good snacks. It is also logical that they do not remain locked for long at home. Sooo that I don’t have to face my Reese’s Pieces cravings already in September, I have created remedy for myself. Ta Taaa! 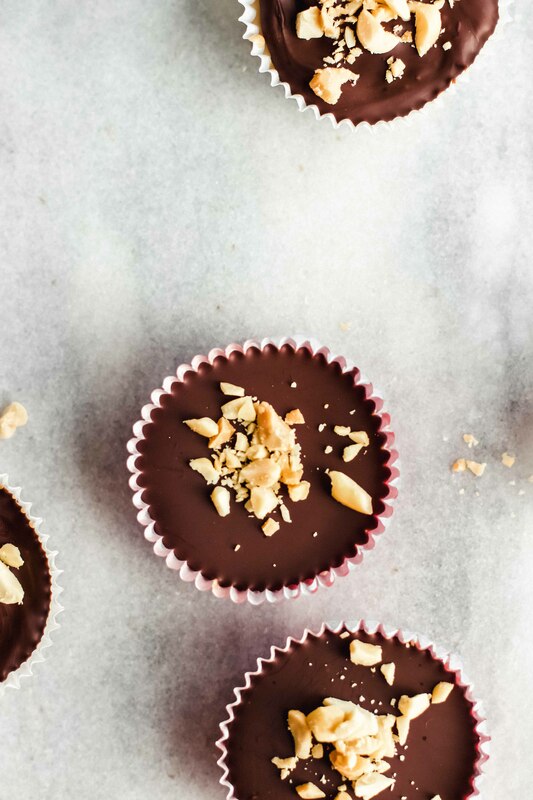 Here are my homemade peanut butter chocolate cups. You probably already know that the reason I like homemade sweets so much is that I can control the amount of sugar myself. Reese’s chocolate is really good, but also really sweet. Refined sugar sweet. 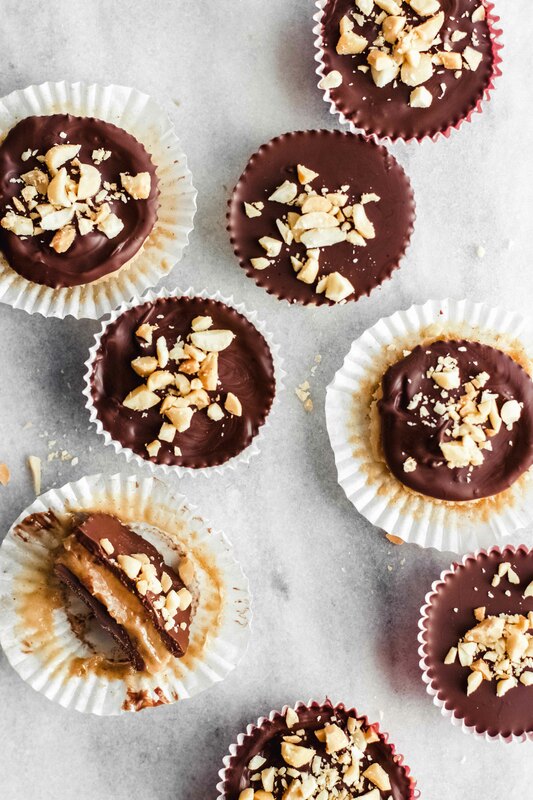 My peanut butter chocolate cups are also really good. Like REALLY good. Also sweet. But with the right sugar in it. That’s a huge difference. The date caramel consists of…DATES! Since these are naturally sweet, you no longer need to add any additional sugar. 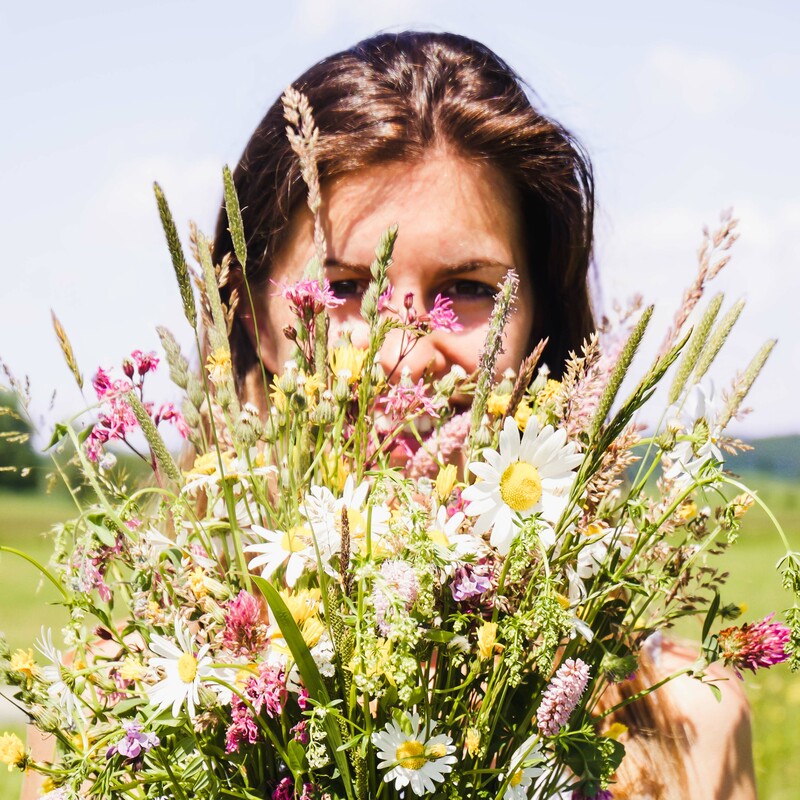 You also benefit from the good ingredients of this fruit: vitamins, iron and lots of potassium are good for our heart health and high blood pressure. Refined sugar, however, would have literally zero good ingredients in store for us and would unnecessarily burden our bodies. Clearly, the point goes to the date version of the caramel. The peanut butter cream has, as far as the sweet part is concerned, only a little bit of maple syrup in it. 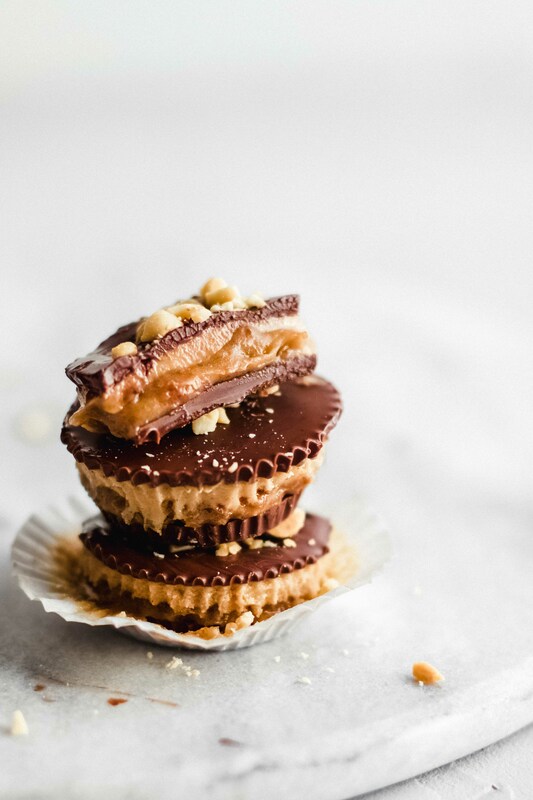 Therefore it is the ideal counterpart to the sweet caramel layer. The chocolate. Oh, the chocolate. For me: the darker, the better! In other words, the more raw cocoa it contains, the better I like it. From 75% I am happy. But I like the 85% most. 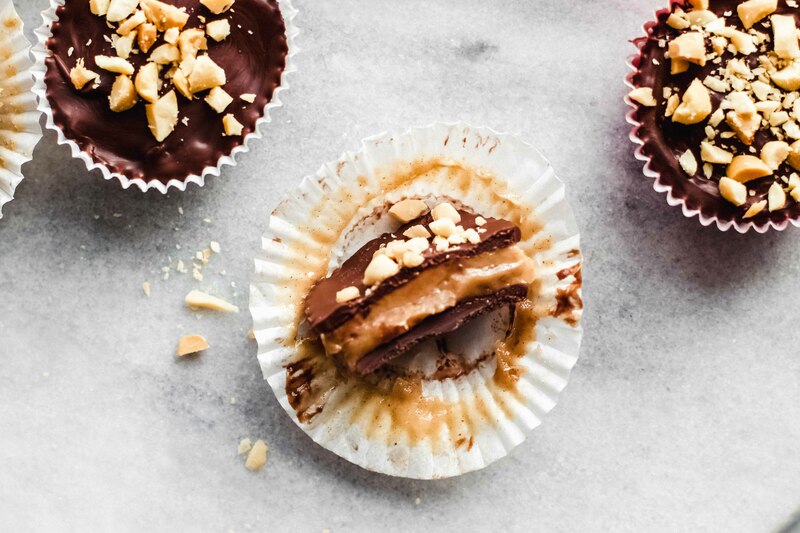 Easy peasy PEANUT BUTTER CHOCOLATE CUPS with date caramel and a creamy penut butter layer. They are ridicuously easy to make and so delicious! Prepare chocolate moulds. 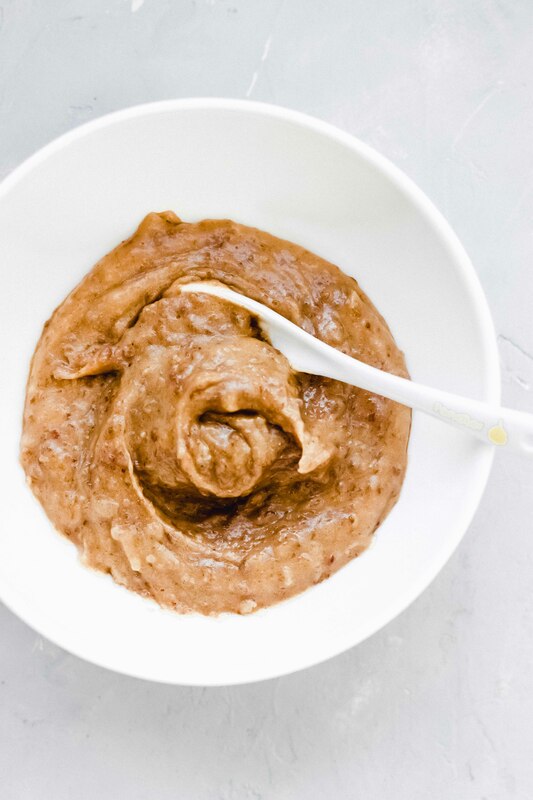 Place the chocolate and coconut oil in a saucepan and melt over a water bath. Pour a teaspoonful of chocolate into the paper moulds. Place in the fridge for a few minutes until the chocolate has set. Put the rest of the chocolate aside for later. Pour the dates into a good mixer and puls a few times until they are small. Add the peanut butter, water and salt and slowly turn up the speed. Stop every few seconds to remove the mixture from the edge. Mix until a caramelly consistency is obtained. If necessary, add another 1-2 tablespoons of water. Pour the date caramel into a bowl. Add all ingredients for the peanut butter layer to a pot. Melt over medium heat for about 5 minutes, but do not let it heat up. Stir again and again with a whisk. Remove the pot from the heat. Remove the paper moulds with the solidified chocolate from the refrigerator. Spread a teaspoonful of date caramel on each. Then add a teaspoonful of peanut butter cream. Place in the fridge for 10 minutes until the cream has set slightly. If necessary, melt the remaining chocolate again and pour a teaspoonful full on top of the peanut butter layer. It should be completely covered. Refrigerate the cups for at least an hour before eating.